EW: The Five is alive! Molly Henneberg expecting. TCG: Why is Politico’s Martin on a jihad against Fox News? NY: How did Al Sharpton get a show? Alan still gets hate mail. 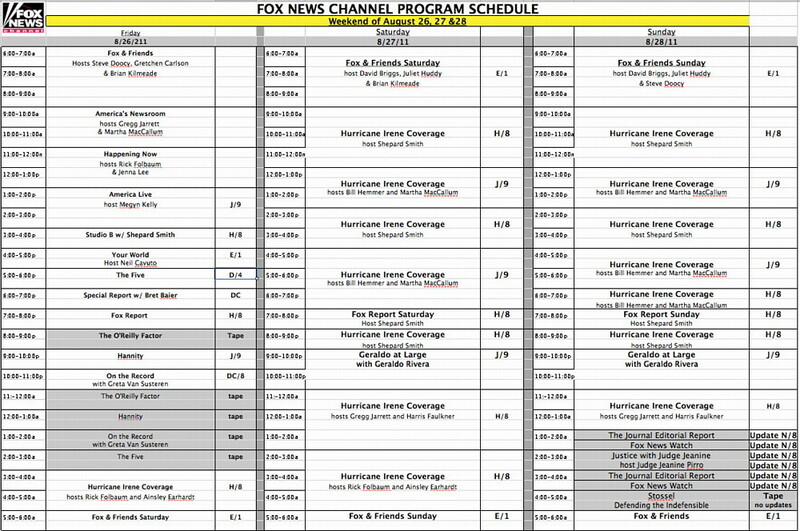 The 13 top cable news programs are on FNC. Q&A: Maddow. Greg Gutfeld, and The Five, have a big summer. August: Fox News rises. August spin: CNN, MSNBC. Video: Coop reports on nonexistent Presidential visit. CNN drops Meserve (v/ICN); buys Zite; teases OutFront: analysis. Video: Charlie Gasparino on GMA. Weekend numbers. Unproven Gawker ‘scoop’ targets O’Reilly and wife. FNC response. Zurawik: ABC rewards ‘crazed, venom-dripping’ Grace. EW: PoliticsNation premiere full of awkward bombast. NYT: Another MSNBC lockstep liberal lecture. Video: Bernard Goldberg on hurricane hype and media vs religion. Whew! 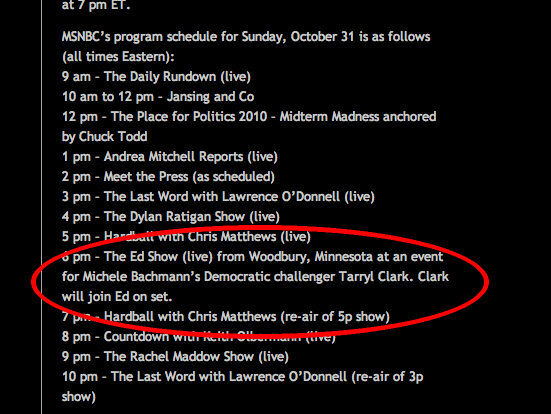 Pivotal MSNBC show saved. Herridge/FNC lawsuit tossed. Gawker threatens undefined exposé against unnamed FNCer. Q&A: Steve Harrigan, Jomanah Karadsheh, Al Sharpton, Contessa Brewer, Coop. Profile: Soledad, Huck. Video: Contessa’s sign-off (via ICN). Video: Andy Levy vs Alec Baldwin part one, part two. Did impartial anchor Jansing get talking point from Think Progress? Contessa Brewer loses anchor spot. 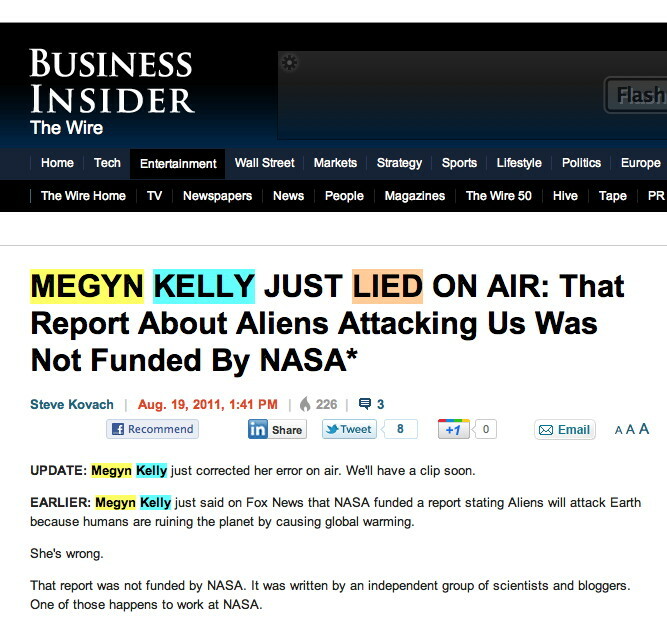 ICN: MSNBC blew it! Miller: No, Al, you’re not just like Huck. MSNBC an hour late. Q&A: Steve Harrigan, Matthew Chance (via ICN). Doyle: Cable news channels obsessed with anti-Obama blood lust! Larry Kudlow’s CNBC show in jeopardy? Freed journos speak: Tadek Markowski (video), Matthew Chance. What cablenews host made 100 most powerful women list? Video: Penguins vs Kilmeade’s new shoes (h/t Carpe Diem). Q&A: Janice Dean. Video: Phantom hands pin Ben’s Stein’s mic. Controversy swirls over Sharpton hire. The Rev compares self to Huck. Did this op-ed seal the deal? Watkins: Al Sharpton opens doors for black journalists?!? Heather Childers officially named to weekend anchor slot. Video: Leventhal and Miller on reporting from Libya. Q&A: John Roberts, Varney, Gupta. Rachel Maddow unplugged. Zurawik: Remarkable tv. CNN’s simulcast. MSNBC takes flak. Hot & Not: Christine O’Donnell, Libya, markets, Ed Schultz. Harris Faulkner and Geraldo expand: 4 more hrs live Libya coverage. CNN cancels Gupta for Libya. MSNBC: rerunning Caught on Tape. O’Reilly and Miller a hit in first Bolder, Fresher gig. Videos: Frank Luntz, Liz Claman on This Week. Zurawik: Media ripping Perry need to be accurate and fair. Video: News Watch on Ed Schultz’s Perry smear and more. Sunday talkers: tip sheet, HuffPo recap. Cramer leaving town again. Deggans: CNN making headlines but not for journalism. Zurawik: Olbermann airs slanderous character assassination. Video: Bias Bash on coverage of candidates’ pastors etc. Varney gets 8pm hour next week; FBN simulcast on FNC Fri 5am. ICN: Has Bill O’Reilly become yesterday’s news? Video: Andy Levy’s devastating ‘apology’ to Chris Brown. Controversy swirls around tweet from tv’s Andy Levy. ICN: Rules for cablenews tweeters. Bad call bites Cramer again. Zurawik: Insufferable Piers and pitiful Christine engage in mutual exploitation. O’Donnell: I was running late. Morgan: What, me rude? Coop’s new timeslot runs into obstacle: Bill O’Reilly. Friday’s numbers: Baier-Juan Williams-Hannity 1-2-3. Video: Bias Bash on Iowa, terrorism. Becky’s baby boy. Stelter: Biznets gain as markets roil. Meet Simon Hobbs. Video: The Amazing Kreskin made a Presidential prediction. Hot & Not: Markets, straw polls, etc. Obama talks with Wolf. CNN skeds 9/11 docs. Soledad special stirs controversy. Zurawik: Maybe Olbermann and Bohrman deserve each other. Olbermann’s Countdown sinks to new ratings low. GOP debate tonight followed by Hannity at 11:00 pm. VIdeo: Bill O’Reilly meets Rizzoli & Isles. FBN out of the red as Dobbs tops Kudlow. Huddy on The Five! CNN to rerun HBO reality show: analysis. Straw poll coverage. Sharpton decision coming next week? Today’s firing demand. Market woes bring big numbers to biz nets. Cavuto: Saturday coverage. F&F: extra hour. CNBC: tonight. Despite controversies, CNN stands by John Defterios. Q&A: Charlie Gasparino on market madness; Tony Maddox. Did MSNBC contributor give political advice to the White House? Video: Fox News Watch on the media vs the debt ceiling. Video: Reliable Sources uses Maddow’s market montage. Coy: The Five gets it right. FNC honor killing special. Q&A: Ed Henry. Sunday talkers: preview, tip sheet, HuffPo recap. Video: Rachel Maddow apologizes for false attack on Limbaugh. 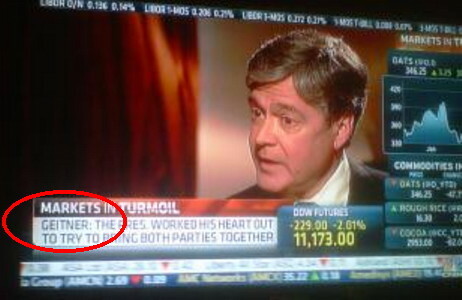 Trader: CNBC sits it out. ICN: CNBC drops the ball. Special coverage: FNC: Cavuto, Fox & Friends; CNBC: Maria Bartiromo; FBN & FNC: Gerri Willis: Q&A/preview. Surprise! ‘Huge’ FNC controversy turns out to be...a joke. Behind the scenes at Your World. Video: Inside Bloomberg. July program ranker: Bill-Hannity-Bret-Greta-Shep 1-5. Video: Chris Wallace w/Don Imus. Pressure on Piers. Q&A: Ed Henry, Rick Sanchez, Soledad. CNN probes coal. ICN: It’s not too late for MSNBC to rethink a bad move. Maddow hypes Sharpton: He’s wicked smart! He’s stupendous! CNBC drops World Business amid cash-for-coverage charges. Video: Bias Bash on overlooked Middle East developments. Don Lemon, riding publicity wave, to sub for Joy Behar. Why is MSNBC stalling its Sharpton decision? Q&A: E-Mac. Video: Alan Colmes w/Imus pt one, pt two. Weekend numbers. Zurawik: Olbermann a fawning pet poodle in Gore interview. Latest Buchanan zinger brings new calls to fire Pat. Update.